To start us off, it’s important to us at Parkway Dance Centre that all members of our team share our vision, our purpose and the philosophy that encompasses everything we do both in and outside of our classes. This is a vision that is shared and demonstrated by the director, teachers and staff members at our studio and it is the driving force behind every interaction with our students and their families. Parkway Dance is a place where kids and adults of all ages shapes and sizes learn to dance and enjoy process of learning. This is a studio where creativity, individuality and self-expression is encouraged and has a community of teachers, students and families who are passionate about performing arts. Our goal is to create a positive and happy experience for all our students. We strive to nurture and develop talent, celebrate the achievements of all students and inspire a love and appreciation of all styles of dance and the arts. We are committed to providing a safe and positive environment in which all students can feel empowered, comfortable and free to express themselves. We believe that dance is an art form and our studio has detached ourselves from the competition dance arena. We found that dance competition does not provide the studio atmosphere with a non- competitive environment that we strive to create and uphold. 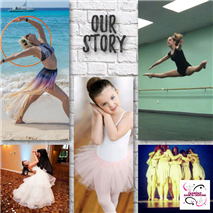 We value our customers and are determined to remain a family friendly dance centre that is recognized for our age -appropriate costume and music choices, and all students matter to us.